I bought a few more things to play with; various mediums (thinner, glaze, and retarder) and a set of colored washes. I used a Retarder Medium to make the basecoat gradient, the retarder allows the paint to dry slower so that you can do wet on wet painting… in this case I used it to blend white and black into a gradient. Next I used various colored washes over the basecoat to color the mini but hopefully utilize the gradient I put down. The green wash was pretty green and I wasn’t sure I liked it, but I kept going. Using a black wash on his pants, sepia on his hair, and gray on his shirt. Next I did some dry-brush highlights… I think this is were the real problem happened… I think I got carried away and it lost a lot of the subtlety. 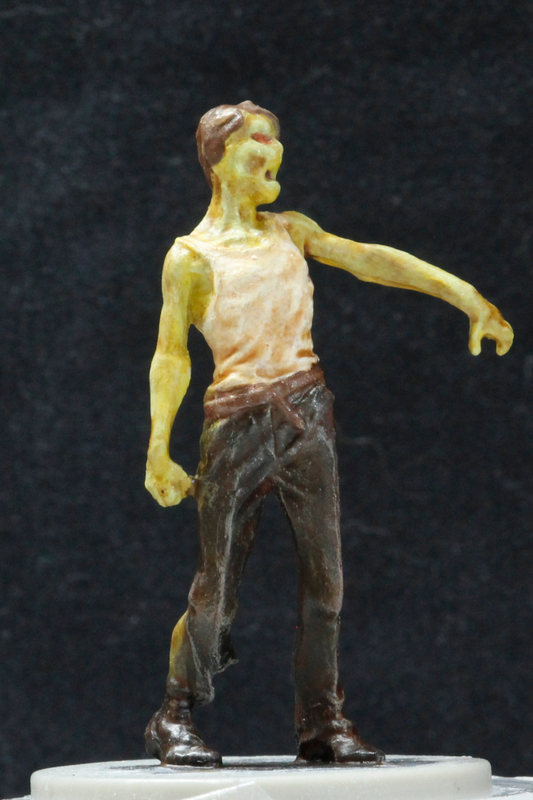 Next, I used the flesh wash from the set of washes I just got (rather than the one I’ve been using), and it was just really maroon… rather than the red/brown I used on the other zombies… honestly, I thought this mini was ‘ruinied’ and I wished I had stopped at the gradient because that was neat looking. I took a step back and decided to try to ‘fix’ it. I repainted the skin, hair and tanktop, leaving the waist down as is… and let it dry while I pondered what to do next. I decided to use the glaze medium with some yellow on the skin, thinned down some neon green to detail the face, and thinned down some pink/brown to create shadows in the tanktop. He was looking much better. Whew. Finally, I did the flesh wash I had been using to add the shadows. It’s interesting, I’m finding that I prefer to fiddle and concentrate on the details, when I tried to do a ‘faster’ method I really didn’t like it. It’s also interesting that you can repaint and try again; with the caveat that you might loose some detail in all the layers, I can see that his face looks a bit melted now and not as detailed, but at least he doesn’t look like he ran through a maroon sprinkler anymore. Haha.